Doctor Who: Big Finish - LAST OF THE COLOPHON Review | Warped Factor - Words in the Key of Geek. Tony Fyler is the last of his kind. Yes, like the best Christmas Walford’s ever had, the fatal words are uttered early on in Last of the Colophon – the Doctor and Leela are on holiday. You can be pretty certain no-one’s going to make it out alive. As it turns out, they’ve chosen a rotten spot to go picnicking – a dead planet with a deeply depressing wind. Quickly though, they discover it’s not as entirely dead a place as they’d thought – the crew of the Third Imperial Consortium Survey Ship Oligarch have just landed, looking for anything of value, having spotted a built structure just up ahead. And so a-yomping we will go. There’s something very reassuring about the set-up of The Last of the Colophon. A building with a door that can only be opened from the outside, and that will kill you as soon as look at you. A man swathed in bandages, the last of his kind, kept prisoner by an android nurse like a cybernetic Kathy Bates in Misery. An intrepid squad of profiteers with guns. And that’s about it. That’s the tightly confined arena in which the story of Morax, the titular Last of the Colophon, unfolds. To be fair, ‘unfolds’ is slightly too complicated a word – what the story does is unfurl like a red carpet in front of us, with very little in the way of kinks or surprises along the way, apart from one central reveal, which is, perversely on audio, something of a visual moment of drama. But the story of Morax, why he’s where he is, why he’s swathed in bandages, what his mindset is and what he attempts to do as the story rolls on, hold precious little in the way of what could be called shocks. Writer Jonathan Morris wears his chief influence (which it would be a spoiler to reveal) on his bandage-sleeve, and there are if not direct references, then certainly tonal references to a number of Tom Baker stories, including The Hand of Fear, City of Death and Horror of Fang Rock, in the infrastructure of The Last of the Colophon. With influences like that and banter of the quality above, all should be good, yes? Well, yes, it probably should. It isn’t, but it probably should. Why it isn’t is hard to pin down – certainly The Last of the Colophon is an agreeable enough way to spend an hour of your time, and hearing Gareth ‘Blake’ Thomas eviling it up right nice in a villainous role is welcome, but there seems to be a need for one more tight edit of the script, and another couple of takes from key performers to really make the story as good as it could – and arguably, should – be. There are two version of Morax’s story, and as soon as you hear one version, you know it’s hogwash – a fact acknowledged in the script by the Doctor just a couple of scenes later. What’s more, the emergence of the truth was inevitable, so it feels like padding to have the villain attempt to deceive everyone. What’s more, a key third-act reveal absolutely doesn’t work – it’s too heavily hinted to be any kind of surprise, so when it happens, you’ve been ahead of the characters (even the Doctor) for about three irritating scenes, meaning you buy into neither the tension nor the triumph in the meantime as you wait for the other storytelling shoe to drop. There’s also a bit of business about the particular sequence of a secret knock which loses its cuteness value really fast. By its third iteration, it’s teeth-gritting stuff. In terms of the performances, they’re mostly sound, with Louise Jameson standing above and beyond the crowd as Leela, going full Sevateem warrior in a couple of key battle sequences. Jessica Martin as Deputy Surveyor Sutton, who becomes a kind of story-specific companion to the Doctor for this adventure, occasionally sounds like she’s been napping between her bits – one bit of ‘When I say run, run’ action is rather diluted by the audible pause before she responds to the Doctor’s instructions. But most of all, it’s Tom Baker’s Fourth Doctor in the last quarter-hour of the piece that leaves a slightly sour note. Loath as we are to criticize the great man’s performance, there are decisions made there, either by Baker or by director Nick Briggs, that feel off – when one of the survey team is discovered to be going to their death, there’s no urgency in Baker’s reaction, just a simple, flat, downbeat statement of the danger, and the team member is never seen alive again. What’s actually more disturbing is the denouement, which has Baker’s Doctor watching a man get strangled to death right in front of him, and simply goad the villain with his own pointlessness. Even when the evil is vanquished, not a word of regret is spared for the lives lost on the way to that outcome, with the result that the Doctor sounds unnecessarily callous. One to pick up then? Overall, there’s great dialogue here, but it would be a mistake to say The Last of the Colophon was ‘must-listen’ Big Finish Who. Pick it up by all means when it’s featured in a sale. 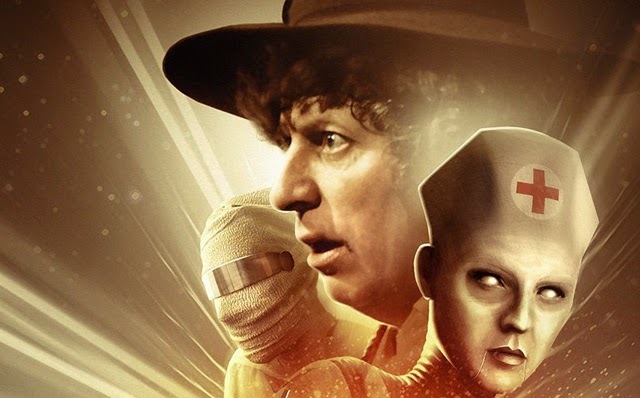 At full price, there are far better releases in the Fourth Doctor range – try The Darkness of Glass or Wrath of the Iceni first.